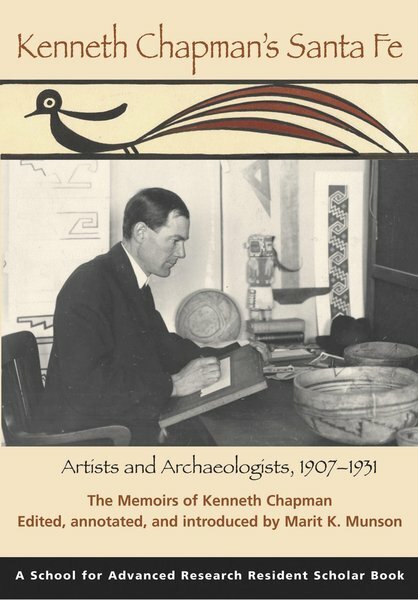 Arriving in New Mexico in 1899, Kenneth Milton Chapman took on all manner of projects: mapping archaeological ruins, judging Pueblo pottery, teaching art, and studying ancient and modern Indian design. He became an “art archaeologist,” a self-made expert riding the line between disciplines. When he moved to Santa Fe in 1909, he found himself in the midst of the city’s identity crisis. Eventually, he played a part in virtually all of the central institutions and critical events that shaped Santa Fe, but he has remained in the shadows. His hard work behind the scenes was obscured by the dazzle of self-promoters like Edgar Lee Hewett; his studies of Indian art and design were overshadowed by the ground-breaking research of archaeologists like A. V. Kidder and Nels Nelson and the artistic accomplishments of well-known Pueblo potters. Now, archaeologist and rock art specialist Marit K. Munson presents a carefully edited and annotated edition of Chapman’s memoirs. Written in the late 1950s and early 1960s, Chapman’s side of the story is an intimate insider’s portrait of the personalities and events that shaped Santa Fe.